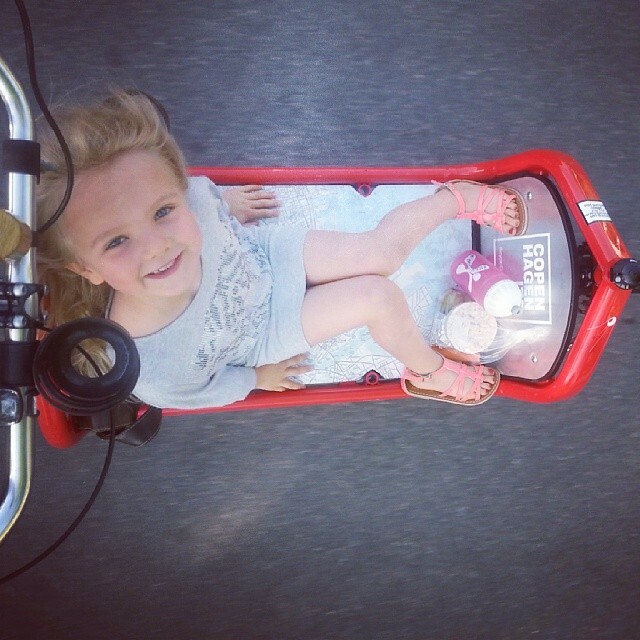 Yesterday I took back ownership of my own Bullitt cargo bike, when The Lulu and I picked it up at Larry vs Harry. You might have heard it was stolen back in March. After a week or so, I resigned myself to never seeing it again. I lived in hope, because another time it was stolen, the Danish internet helped me get it back. On Sunday evening, I got this photo sent via MMS and on Facebook. WTF. My bike parked outside Larry vs Harry. It was found at Christiania by a guy named Danni and taken from there and put outside Larry vs Harry. An amazing story. I called Danni and he was all like "no problem...". I got the details of the story yesterday when we picked it up from Claus. And it is amazing. I realised I know Danni. I chat with him every year at the Svajerløb - Danish Cargo Bike Championships and I chatted with him at the recent bike flea market. Ironically, about whether or not I had found my Bullitt. Danni's own Bullitt is well-known here. He extended the frame to make it extra long. This shot is from the flea market a few weeks back. He has a kid around the same age as The Lulu, too. So it turns out Danni was out for a ride on his motorcycle and ended up at Christiania. He saw three Bullitts behind the Månefiskeren café and he recognised one of them. Mine. 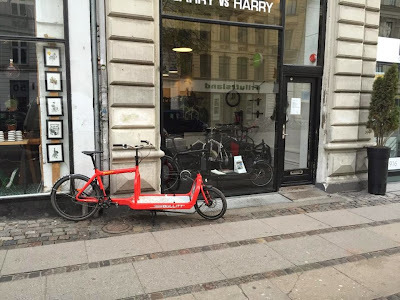 Still with the map of Copenhagen on the cargo bay and even the Copenhagenize Design Co. logo sticker intact. Danni rode his motorbike home to Hvidovre - a suburb of Copenhagen - and returned with his minivan. He put my Bullitt in the back and went to a bike shop to buy a lock. He then drove it to Larry vs Harry and locked it outside the shop. He let Claus from Larry vs Harry know it was there and he, in turn, notified me. How amazing is that. 30 km and a couple of hours out of his day. Just to get the Bullitt back for The Lulu and I. Thanks Danni. The Lulu is making him a drawing and I'll figure out a suitable gift.